Starring: Hugh Bonneville, Hugh Grant, Brendan Gleeson, Sally Hawkins, Julie Walters, Jim Broadbent. The late author Michael Bond’s stories of a marmalade-loving bear from Peru have been enchanting children for more than half a century. Director Paul King’s 2014 live action movie adaptation stayed true to the humour and charm of the books (and the 70s TV series many grown-ups fondly remember), and his sequel manages to be even better – it’s funnier, cuter, better plotted, and as an added bonus, features the most hilarious performance Hugh Grant has ever committed to film. Paddington the bear (voiced by Ben Whishaw) is happily settled in London, living in the idyllic Windsor Gardens with the Brown family. Although Mr Brown (Bonneville) is having something of a mid-life crisis, life is pretty normal until the day Paddington discovers a pop-up book of London in Mr Gruber’s (Broadbent) antiques shop and decides it would be the perfect 100th birthday present to send to his Aunt Lucy at the home for retired bears in Peru. He’s not the only one interested in the book, however, as local actor Phoenix Buchanan (Grant) has his eye on it too, and will do anything to get his hands on it – including stealing it right from Paddington’s paws and framing him for the crime. With a plot that manages to weave in a miscarriage of justice, a robbery, Paddington in prison, a train chase, a nefarious master of disguise, a treasure hunt and a daring rescue, this speeds along at a joyously sprightly pace. 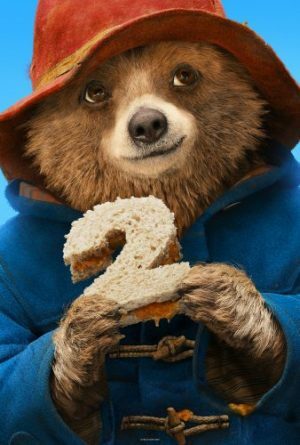 There are laughs aplenty as Paddington causes havoc doing odd jobs to earn money for Aunt Lucy’s present, and more still when he ends up in jail and in the kitchen alongside grumpy inmate Knuckles McGinty (Gleeson). However, while Gleeson and the talented cast (which also includes Richard Ayoade, Joanna Lumley, Peter Capaldi, Sanjeev Bhaksar, Tom Conti and Ben Miller) are all terrific, they can’t quite match the deliciously daft Grant, who will have you crying with laughter at his failed actor as he stars in a dog food commercial, dresses up as a nun or preens about in his tweed suit and cravat. Just when you think he can’t be any sillier, he is (just check out his grand finale), and it is simply wonderful. 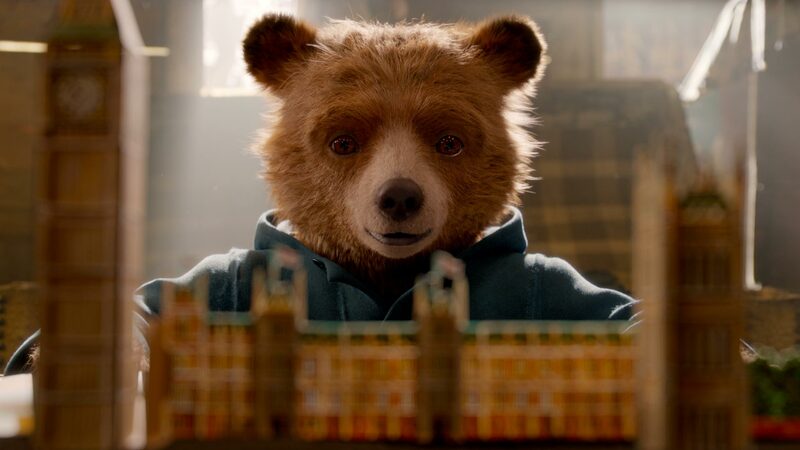 In director King’s hands, Paddington 2, like the original, is one of those rare movies that really is meant for both adults and children. Set in a slightly unreal, somehow perfect London (Mr Brown works in the Shard, there never seems to be a traffic jam, and just about anyone can afford to live in one of Windsor Gardens’ mighty mansions), it’s a skilful mix of physical comedy (a barber shop scene is like a furry homage to Charlie Chaplin), warm humour and sheer delight that should enchant everyone. Paddington may not be the criminal Phoenix frames him to be, but in this adorable sequel, he will certainly steal your heart. SPOILER: Paddington 2 is aimed at all ages. Very young children (under-5s) may be worried about a few scenes when Paddington is in danger, including a scene late in the movie when he may drown, but it is resolved quickly. Very young children may also be upset when Paddington is sent to jail and is lonely. I am 42 and was upset when Paddington was lonely!